A book review of The Heart of Harry Quantum by Pepper Harding. Post may contain affiliate links. 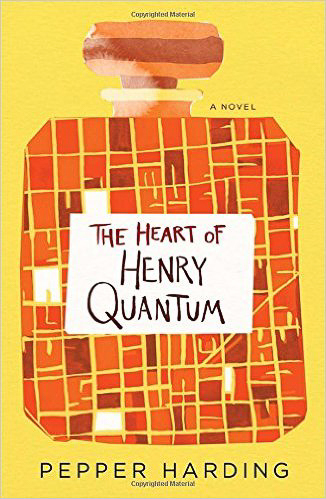 The Heart of Henry Quantum – Reviewed! I love novels that explore the way we think, like The Heart of Harry Quantum by Pepper Harding. We are introduced to Harry Quantum on December 23rd when he realizes that he needs to get a Christmas gift for his wife. He settles on a bottle of Chanel No. 5 purchased from Macy’s – perfectly easy to get first thing in the morning. Then it all goes downhill or uphill, depending on how you look it, from there. You see we are voyeurs in the thoughts of Harry Quantum. It starts when he is washing his hands and the water bouncing off of them caused him to think about the impermeability of his skin, which led him to think about the wonder of nature, which really is the entire cosmos which brings about thoughts of the Hubble telescope and the photos he saw at the NASA exhibit…and so on. This is how Harry’s mind works and it works constantly. As if his thoughts weren’t enough to distract him, he runs into an old girlfriend, Daisy. While Harry is wallowing in his thoughts about everything including Daisy, his wife Margaret is doing her own thing, with her own secrets to keep. I realize this novel is not for everyone, but I love novels that get into the quirkiness of people, of what makes them tick. I didn’t particularly like any of the characters, but that didn’t stop me from enjoying reading about them. I received an ARC copy of this book. OK, now I need to look for this one – thanks for bringing it to my attetion!